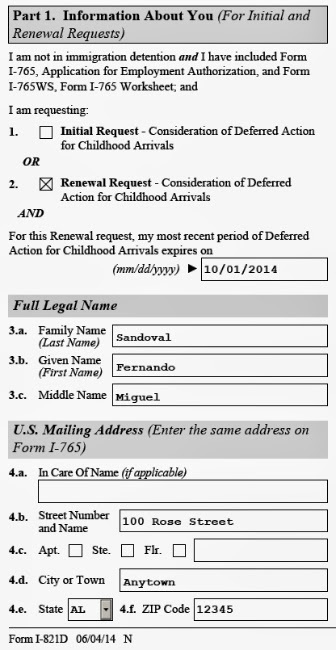 Starting June 2014, all DREAMers who are applying for Deferred Action for Childhood Arrivals (DACA) for the very first time or renewing their previously approved status must file the form dated June 4, 2014, in addition to USCIS Form I-765 and Form I-765WS if employment authorization is also desired. While it is strongly recommended that you use a qualified immigration attorney to do the paperwork for you, if you fluent in legal English, have experience completing legal forms, and are willing to take the risk, then, you can also file it yourself. The help given on this page is obviously not legal advice and you are using it at your own risk, but follow the links below to complete the whole application section by section (each link will open in a new window for convenience). Ideally, the answers to all questions from 1-7 should be no. If there is even one Yes, please do not file it yourself, and instead use an attorney. 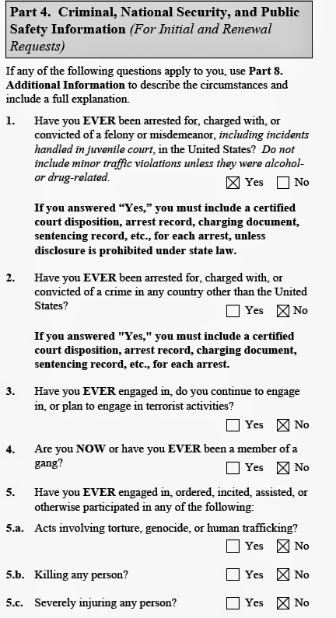 In the example below, though, I have marked Yes for question #1 assuming that the DREAMer only had a misdemeanor and can furnish all the paperwork. Remember that just because you have a criminal background it does not mean that you will not be approved because many DREAMers with criminal backgrounds have been approved; you just have to be prepared for the worst and provide the information in the right format. It is important to point out that an alien illegally in the United States will be breaking US law if she or he joins the military by making a false declaration about her or his immigration status (undocumented aliens are not allowed to work for the armed forces). 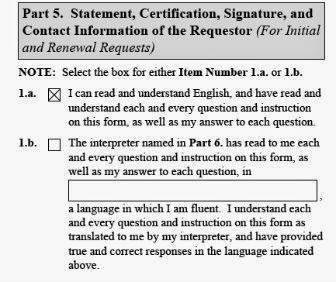 Accordingly, for those DREAMers who are applying on their own for DACA, the answer to question #9 should be No. If it is yes, please discuss your case with an attorney. DO NOT file the paperwork yourself as this will open a can of worms. 7. Simply mention the name of your school, city, and state. 8. 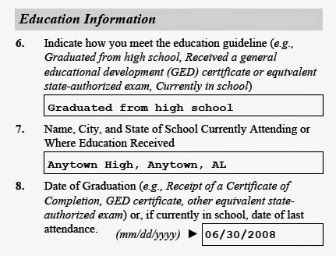 If you already graduated or received a certificate, write down the date from your diploma. If still in school, write down the date of last attendance, which can even be today's date if you are in school. 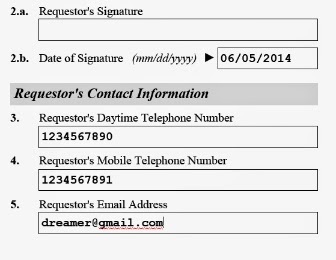 This section need not be completed by DREAMers who are applying for renewal. However, if you are applying for the very first time, you must affirm that when you first moved to the United States before your 16th birthday (merely saying Yes to question 1 is not enough; you will need to provide solid evidence of being in the US). In 2, enter your date when you moved to the US to live here (whether legally or illegally). In 3, enter the name of the airport if you arrived by air. If you crossed the border illegally, write down the name of the place. In question #4, pick 'no lawful status' if you crossed the border illegally. 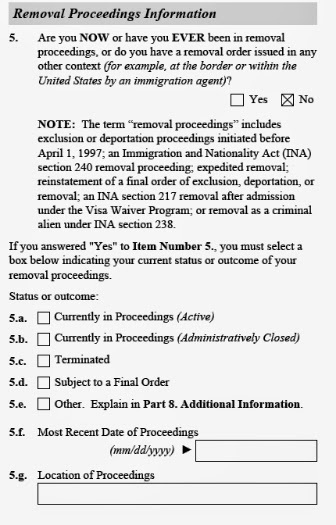 Choose 'status expired', if you came with a valid visa and cleared immigration at an airport or land crossing but then never left so that you were out of status on 06/15/2012 (if you were in status on this date and later on your status expired, you are not eligible for DACA), and finally choose parole expired, if you had some kind of a parole status but it expired. 5a. 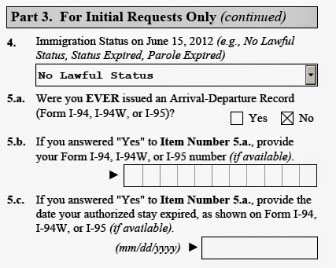 If you entered the United States legally, meaning that you met an immigration officer (also called as 'inspected') either at an airport or land crossing, you must have filled and then received an arrival-departure record in form of an I-94, I-94W or I-95. If so, check Yes. 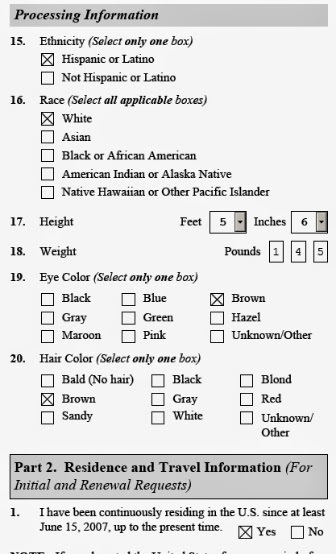 If you do not know, ask people with whom you came because it is very important to find out if you entered the US legally or illegally because it has huge consequences on your immigration journey (typically, aliens who entered the country legally but are now undocumented can adjust their status in the US while those who entered without inspection must leave the US to get a green card). 5b. If you have the card with you, enter the number here. You can also find out the information in some cases here in case you lost your card (though not old data is there). If not, just leave it blank. 5c. 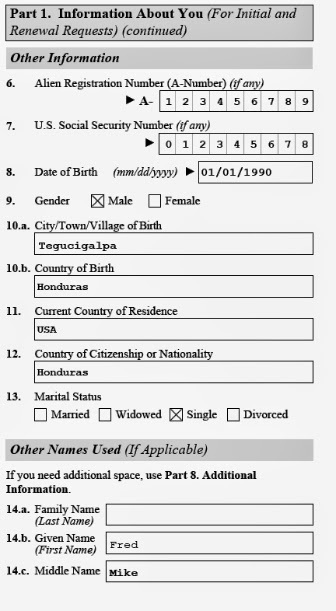 If you have the card, it will also show the date on which you were authorized to stay in the US. If you lost the card, then simply leave it blank. Ideally, you should have stayed continuously in the United States since June 15, 2007, but the Obama Administration is forgiving short absences if they were for a good cause (e.g. visiting ill family members, funerals, etc.). You will need to provide those details in this section. If you are a DACA approved DREAMer and applying for renewal, then you are allowed to travel using advanced parole, and this is the place to provide details of your trip. For renewal, you only need to provide trips after being approved previously. Also, if you have a valid DACA approval but left the US without advanced parole, you must consult an attorney before filing for renewal because you may have violated terms of your approval and could be rejected. 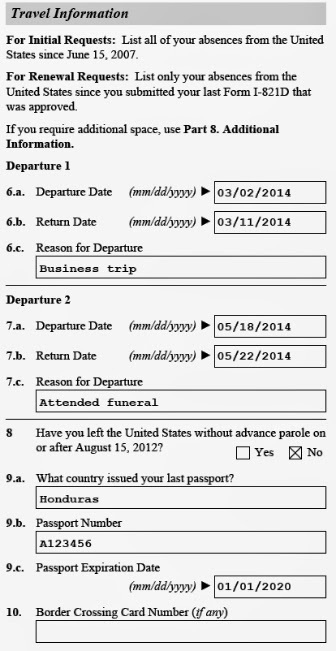 6, 7 (a, b, c): In this example, the applicant is DACA approved and took three trips (the third trip must be listed in part 8) using AP. Just enter the date of departure and arrival and a brief reason for the trip. Our example DREAMer attended a funeral in Honduras and took two business trips, one to attend a meeting with a customer and another to participate in a conference. 8. If your answer is no to the question about leaving the United States without an advanced parole approval, you must consult a lawyer and not file an application on your own. 9 (a, b, c): Simply enter your passport details here. 10. If you have had a border crossing card, enter the number in the box. 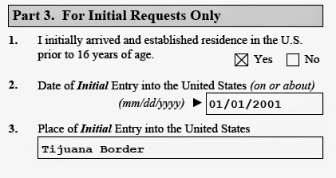 Before you go any further you will have to check the box affirming that you have been continuously residing in the US since June 15, 2007 up to the present time (this is an essential requirement for DACA approval). You not only have to check Yes to this question, you also have to provide reliable evidence of your physical presence before 06/15/07. If you cannot prove it with solid evidence, it is best not to apply and waste your time and money because even if you were here but do not have the evidence, your application will be rejected. 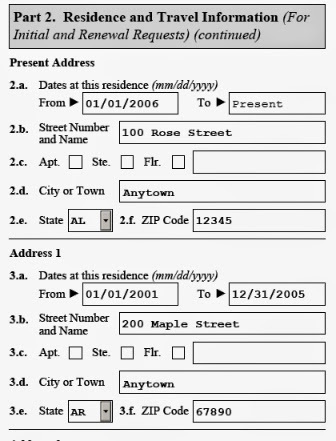 2, 3, 4, 5 (a, b, c, d, e): Enter the date and address where you currently live. If you have lived elsewhere, enter it below. 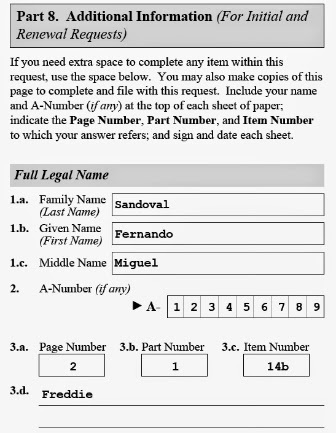 If you are renewing, simply enter the information after you were approved for DACA.